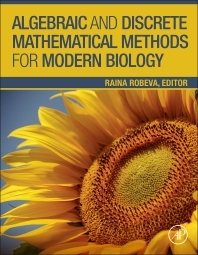 Written by experts in both mathematics and biology, Algebraic and Discrete Mathematical Methods for Modern Biology offers a bridge between math and biology, providing a framework for simulating, analyzing, predicting, and modulating the behavior of complex biological systems. Each chapter begins with a question from modern biology, followed by the description of certain mathematical methods and theory appropriate in the search of answers. Every topic provides a fast-track pathway through the problem by presenting the biological foundation, covering the relevant mathematical theory, and highlighting connections between them. Many of the projects and exercises embedded in each chapter utilize specialized software, providing students with much-needed familiarity and experience with computing applications, critical components of the "modern biology" skill set. This book is appropriate for mathematics courses such as finite mathematics, discrete structures, linear algebra, abstract/modern algebra, graph theory, probability, bioinformatics, statistics, biostatistics, and modeling, as well as for biology courses such as genetics, cell and molecular biology, biochemistry, ecology, and evolution. Students and researchers in biomathematics, mathematics, and biology. 8.1 Introduction: Why Do We Want to Model Infectious Diseases? 8.3 How Does the Computer Run Simulations?